You may have noticed that I love chocolate brownies: both baking them and eating them! All my own brownies are here, but while it is Chocolate Week I thought it would be great to round up other foodies best brownie recipes as well. Fresh fruit in brownies is great: it oozes into the batter as it cooks, giving the whole brownie a hit of fruity flavour. Jacqui from Recipes Made Easy loves these blackberry brownies. You can use fresh blackberries or frozen would work as well. 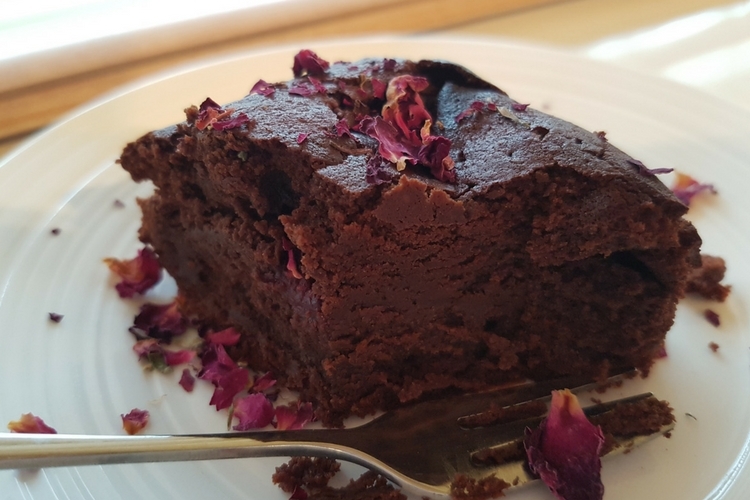 My rose and raspberry brownie imparts fruit and fragrance in every bite- something so exotic about them! Helen at Casa Costello adds fruit to her brownies too…but of the chocolate variety! Her chocolate orange brownies have orange running all through them. Oh, oh, oh. I just realised that pumpkin is a fruit too! So my pumpkin spice brownies can get a look in too! HodgePodgeDays’ Jane has put dried cherries in to these chocolate cherry brownies, and look at those fudgey middles- perfection! Anyonita Nibbles, who did a guest post on here recently, has some amazing gluten free sticky toffee brownies. I really want these with custard as well as the sauce. For a bit of crunch, you can’t beat nutty brownies. Over at Supper in the Suburbs, Emma makes crunchy peanut butter brownies. When Kavey Eats brownies, she does so with carob molasses and tahini. Now I have a use for the left over tahini I always find in the fridge! And finally, if your brownie isn’t indulgent enough, Suzy from Sudden Lunch stuffs them with more treats. Calorie counting be damned! This is why I love brownies, so much variety. You can make a brownie to suit every mood and taste. They are rich, so a tray goes a long way, and are perfect to share. Let me know your own fave brownie recipe below and I will share this week. Pin your next chocolate brownie bake!